Clearly the best mobile dog wash trailer and bathing system in the World! The Aussie Pooch Mobile dog wash trailer is open allowing the dog to have a good view out and not feel trapped. This is important to ensure the safety of the operator. The open design also allows airflow keeping the operator cool or can be closed with clear sides which keep out the cool but retain the open plan. The Aussie Pooch Mobile dog wash trailer is also built from high quality steel which is long lasting and requires minimal maintenance. Other dog wash trailer designs do not encompass these important points and have been proved to be inferior. 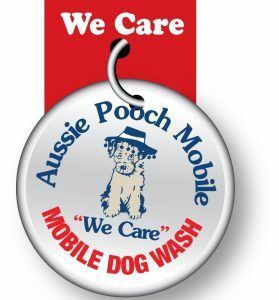 All Weather Conditions: The Aussie Pooch Mobile dog wash trailer is being used in all weather conditions worldwide (under The Pooch Mobile brand). Clear windows can be left open for airflow, or closed for protection from the elements. The complete service can be provided from inside the dog wash trailer. The mobile unit is adaptable to use in low temperatures of below 15 degrees centigrade up to the extremes of the tropics with few modifications. Dog Psychology: the Aussie Pooch Mobile dog wash trailer has been designed with dog psychology in mind. The pooch will feel confident and comfortable with the open design of the mobile unit, which will put them at ease while they are being pampered. This is important for the safety of the operator. Promoting your Business: The customers and passers by are able to see pooches being pampered. This puts both the pooch and customer at ease and attracts attention for the business. Advertising space: The trailer door (inside) is designed to promote services and retail items. Cleanliness and Appearance: an easy to clean environment ensures the dog wash trailer is in A1 appearance at all times. The Aussie Pooch Mobile dog wash trailer can be completely hosed throughout to ensure it can be kept hygienically clean at all times. Heater and Water Storage: The Hydrobath and 70 litre water storage tank are designed with heaters, so there will always be warm clean water for every dog. The storage tank is essential for the times when the operator may not have access to water. Built to Last: With thanks to our franchisees we have custom designed a purpose built dog wash trailer that is long lasting, affordable and dependable. The trailer will become your prized asset giving you years of hassle free operation allowing you to get on with the task of washing dogs in a well presented specialty unit. 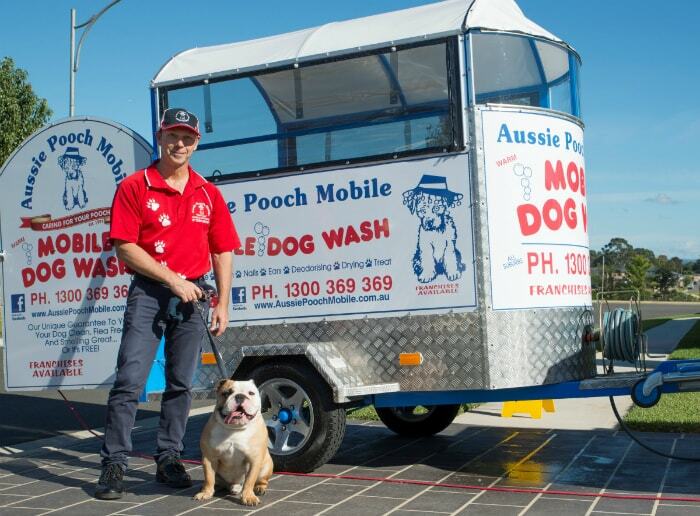 Exceptional Customer Service: The set up of the Aussie Pooch Mobile dog wash trailer ensures exceptional customer service. Aussie Pooch Mobile operators never have their back to the customer, which gives the opportunity to liaise with them while pampering their pooch. The latest Aussie Pooch Mobile trailer is with out doubt the best mobile Hydrobath trailer in the world!